Year 5&6 Strand 2 - Science Inquiry Skills - sub-strand 1 (Questioning and predicting) and sub-strand 4 (Evaluating) NB Teachers can guide students to pose the types of questions that will lead to the doing the extension activities). Students will be introduced to the scientific concepts of states of matter (solid, liquid, gas), thermal expansion, air pressure, vacuums and misconceptions in science. A glass jar large enough to hold the candles. Three coins. They should all be the same type. I find five cent coins work well. Caution: This activity involves using matches and fire. For any activity involving fire you must have an adult present, plus water, a fire extinguisher and any other safety equipment the adult or yourself feels is needed. Take care that you only use fire in a safe place. 1. Put a strip of masking tape onto the side of the jar. 2. 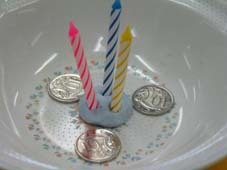 Stick a lump of plasticine in the middle of the bowl and one candle in it. 3. Pour a couple of centimetres of water into the bowl. 4. Light the candle and let it burn for a few seconds. 5. Carefully place the jar over the candle. 6. Time how long it takes between putting the jar over the candle and when the candle goes out. After the candle has gone out, some water will be sucked into the jar. 7. Mark the water level on the tape. Now answer questions 1 and 2 and then do steps 8 to 10. 8. Take the jar off and wave at the end of it, so you put some fresh air into the jar. 9. Repeat steps 3-6, but this time only use three candles. If the water reached the wick the first time, it may take a while to get burning again. 10. Compare the time it takes for the candles to go out and the water level this time with the previous time. If the jar fits perfectly against the bowl, you may find the water can't get in. In this case, the jar will not fill with water, but will be held against the bowl like a suction cup. To stop this happening, place some small coins around the candles so the jar rests on them, with a small gap to allow the water through. Oxygen makes up about one-fifth of the air. When the candles burn, they use oxygen from the air. When there is no more oxygen in the air, they go out. The reason the water is sucked up into the jar is a little more complicated. When fire burns, it combines oxygen in the air with carbon and hydrogen in the candle, to make carbon dioxide and water vapour. This means that although there is less oxygen gas inside the jar, it has been replaced with other gases. The exact amounts of carbon dioxide and water are hard to predict, because candle wax is made of a mixture of different chemicals. In most of the chemicals in candles, there are roughly two hydrogen atoms for every carbon atom, which means roughly two-thirds of the oxygen joins with carbon to make carbon dioxide (two oxygen atoms and one carbon atom) and one-third joins with hydrogen to make water vapour (two hydrogen atoms and an oxygen atom). 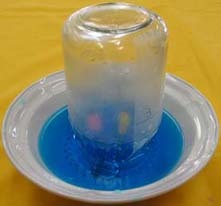 Even if the water vapour condenses into liquid water, this is not enough to account for all the water being sucked up into the jar. 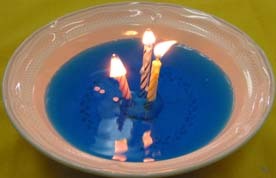 The fire uses up oxygen while it is burning, but the water is only sucked up after the candles go out. If the water was being sucked up because the oxygen was being used up, it should start moving the moment you put the jar over the candles and stop when the candles go out. One candle still uses up the same amount of oxygen in the jar, it just takes longer to do it. However, when you only use one candle, there isn't as much water sucked up into the jar. So why is the water sucked up? Another possible explanation is how gases respond to a change of temperature. When air is heated, it tries to expand, so it takes up more space. When air cools down, it contracts, so it takes up less space. When you put the jar down over the candles, the fire heated the air inside the jar. As it was heated, the air expanded. If you put the jar down quickly, you may have noticed some bubbles escaping the jar (if you put it down slowly, the expanding air has time to escape out the bottom of the jar before it hits the water). Once the candles go out, the air in the jar cools down and contracts. The water is then pushed in by the surrounding air as the gas pressure inside the jar is lower due to there being less gas molecules inside the jar than when you started the whole procedure. The reason that three candles had a greater effect than one is because they heated the air in the jar to a higher temperature. There is one other factor at work too. Carbon dioxide made by the fire can dissolve in the water, which would reduce the amount of air in the jar. However, this appears to only be a small effect, because the carbon dioxide is made all the time, but the water is not sucked up until the fire goes out. I have also found that if the jar seals perfectly against the bowl, the air inside will still try to contract, even if there is no water inside the jar. This is a simple activity to explain the principle that hot air expands, cold air contracts. 1. Put the balloon onto the mouth of the narrow bottle so no air can get in or out. 2. Pour hot water into one jar, and pour cold water into the other jar. Only fill them half-way, so they don't overflow in the next step. 3. Put the bottle with the balloon on it into the jar of hot water, and watch what happens. 4. Now put the bottle with the balloon on it into the jar of cold water for a few moments. When you put the bottle with the balloon into the first jar, the hot water heats up the air in the bottle and causes it to expand. (Gases always expand when they're warm - the heat gives the gas energy to spread out more). The expanding gas blows up the balloon. Have you ever seen a hot air balloon floating in the sky? What keeps them up? Why do they have to be so big? Why don't they usually fly in the middle of the day? What will happen to the bounciness of a ball if you cool it down or heat it up? Begin by filling up your ball to its standard pressure. Have a friend hold the metre stick so that it's sticking straight up from the floor. Drop (DON'T THROW) the ball onto the floor from about waist height next to the meter stick. Measure how high up it bounces. Make sure you measure from the bottom of the ball and repeat 2 or 3 times so that you get about the same amount each time. This measurement will be your "control bounce." 1. Begin by predicting what will happen as you either heat or cool the ball. Will a warmer ball bounce higher than a cooler ball? After you make your prediction, place the ball in a refrigerator or esky with ice for about 15 minutes. Take it out and try bouncing it again. Remember to drop it from the exact same height on the exact same floor and measure the exact same way! How does this number compare to your "control bounce"? 2. Let the ball heat up to room temperature again and then use the hair dryer to heat it up for about 2-3 minutes. Test it again. Was your prediction right? Hot air balloons are the most elegant way to fly - build one from normal kitchen materials. 1. Empty the crumbs out of your toaster. 2. Put the cardboard around the toaster. Make sure it sits above the toaster about 10 cm so the plastic bag does not touch the toaster. 3. Put the plastic bag over the cardboard. 4. Turn on the toaster. Be careful because the toaster will be very hot. It is more impressive if you can find somewhere with a high ceiling to do the experiment in. The plastic bag should gently float up into the air. It may be unstable and fall over - if this is the case adding some tape on the bottom may stabilise it and make it fly for longer. You wouldn't think it, but air is quite heavy, a cube 1m x 1m x 1m of air weighs about 1kg. So inside a normal pedal bin liner there is probably at least 60-70g of air. When you heat up air it expands. This means that not all the original air will fit in the plastic bag and maybe 6-7g will fall out of the bottom. If the bag only weighs 5g then the combination of the bag and the air inside it is now lighter than the equivalent amount of cold air. If you put something less dense than water in water it floats, similarly if you put something less dense than air in air, it also floats, so the balloon floats up towards the sky. If you look at the bag the heaviest bit is the base (now at the top) where the plastic is all gathered together. Having the heaviest part of the balloon at the top isn't very stable, this problem can be solved by adding tape to the bottom, making this heavier, keeping everything the right way up. We're all familiar with the fact that hot air expands and cold air contracts. This video takes that idea to a level beyond what we see in everyday life. We take balloons filled with air and cool them with liquid nitrogen, which is at a temperature of minus 196 degrees Celsius. The balloons shrink visibly as the air inside them contracts. Some of the air even condenses into liquid air. When we remove the balloons from the liquid nitrogen coolant, they warm back up to room temperature. As they warm up, they expand to the size they were before we cooled them in the first place. How much water was in the jar when you first placed it over the candle? When did the water level inside the jar begin to rise? Compare the time taken for one candle to go out with the time taken for the three candles to go out. Which of the following statements is true? The of candles did not alter the time taken for them to go out. Fluids like air and water move from areas of high pressure towards areas of low pressure. Which of the following statements about your experiment is true? When the candle was alight the air pressure inside the jar was greater than the air pressure outside. When the candle went out the air pressure inside the jar was less than the air pressure outside. When the candle went out the air pressure inside the jar was greater than the air pressure outside.